The Fundamentals of Engineering (FE) exam is the first step in getting your Professional Engineering license. Read more information about Testmasters FE-CBT prep courses. The Principles and Practice of Engineering (PE) exam is the second step in getting your Professional Engineering license. There is a PE exam for each Engineering discipline. 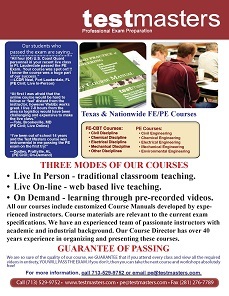 Read more about Testmasters PE prep courses. The scaled maximum score for the FE and PE examinations is 100. Very few, maybe less than 1%, make 90+ in the examination. Listed below are the engineers who took Test Masters courses and scored 90+. We know the actual number of students who scored 90+ is much higher because the majority of states don’t release the passing score. These engineers are the best of the best, and Test Masters is very proud to present them to the engineering community.